Hello! And Happy Hump Day. 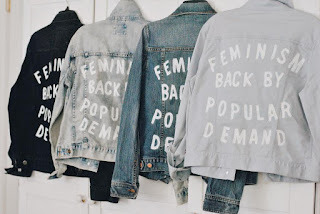 This is kind of a combo DIY and a Be Well Wednesday post. I didn't post a Motivation Monday because who needs to be motivated for Labor Day, which is non labor for most of us right? Having a 3 day weekend was such a blessing as I was prepping myself for what was going to be a challenging emotional Tuesday, and there was no way around it. So I needed to get my hands dirty, literally. When I think of well being I think of the importance of doing something that you love to do, that sooths the soul and that you may not always have time for. For me that's communing with nature. 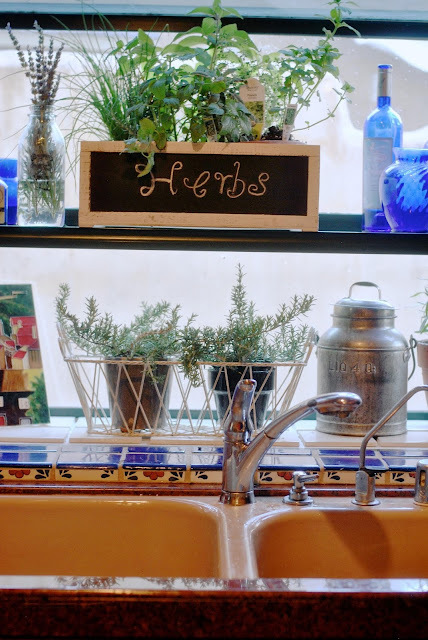 However being it was over 100 degrees all weekend and being outside in general and especially in the garden was very unpleasant I decided to re-do my kitchen window and plant an herb garden. Starting with an early trip to the garden store before it got too hot, I filled a little red wagon with basil, lemon balm, rosemary, tarragon, thyme, chives and sage. 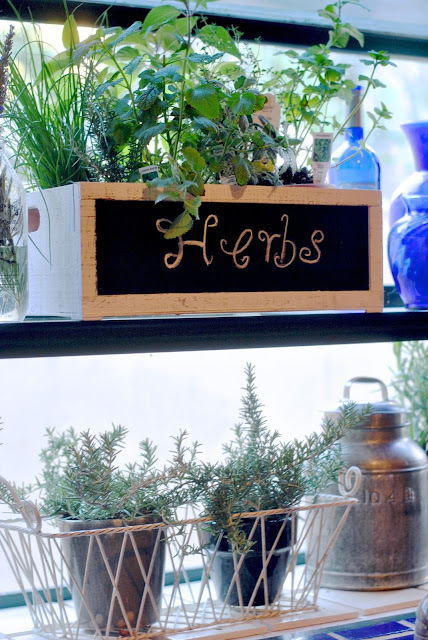 I had picked up the cute little box at Micheal's crafts store on Saturday, it was perfect, with a chalk board front for me to write herbs, exactly what I had pictured. Plus it was on sale for 20% off and I had a coupon for 40% off. Ended up costing only $12. I love that store! I lined the box with a foil pan and then transplanted into terra cotta pots in three sizes in order to get them all to fit. The rosemary went in separate pots. If you have a 99 Cent Store or a Dollar Store check it out for terra cotta pots we get them there and they are exactly the same as the expensive ones at the garden store or Home Depot.